pianota's review (This content has been automatically translated from French)" Quality keyboard and full of rhythms"
I bought it first for its rhythmic possibilities, a treat! You can make a group alone; well made dishes, patterns of batteries, you can play music, launch an intro, then a rhythmic verse, chorus start, just press the button when you enter dan the last measurement and go! Wholesale good place for functions. 76 notes, sufficient for the majority of pieces, many sounds effects. Ah yes, this is the only model that has a sustain function. If you do not pedal, no problem, you enable the function and can play as if you had one, great! Amplification 2x6W is good, and the speakers have two nozzles (while NPV60 has a small nozzle dummy, beware!) And his fate so extensive. A little too much reverb for my taste but good momentum. His piano quality (but NP31 is a bit better), semi heavy touch as NPV60 NP11 and NP31 but won the Oscar (a little heavier than the other 3). good config, easy functions, simple manual, nothing fancy though all these buttons can be put off a bit. If it can help some, so much the better because opinions stores are not always the same, I know. That's why I wanted to compare and make my idea. philrud's review (This content has been automatically translated from French)" I love it: too much!" Manual clear paper and downloadable manual at yamaha.com on the web, free and clear too. 1st test: do not worry, one support button, turn the wheel, it does start and go Be careful not to let some buttons "on" when you do not need it ... You can have! surprises like, "is there a piano player in my place But it is either." It is easy to use for functions principales.Les more detailed functions, I have not regardé.Mais choose a style , an instrument, play dual or split or arpeggiator is simple here. I use it for 2:00 before I had a yam 'ypt220 of débutant.J I have the opportunity to play on a real piano right from time to time and I felt here, the sensations of real piano, even For me ... if a touch too light, it's not good, but a touch too heavy, it is not easy aussi.Ici, it is between the two. To listen to the sound of the piano, go philrud (me), in com 'and listen to the song "First Steps", I just save it Yam' NP-V80. Maetronom's review (This content has been automatically translated from French)" Very good value for money"
This is my first "synth" I've had about 6 months and I'm really happy. It is versatile and easy to access and manipulation. I bought eyes closed trusting the same quality Yamaha synth for entry level series ("Piaggero"), and I really have not been disappointed. Very, very good value for money therefore an excellent first keyboard that I think will continue to satisfiare me later. Ferry c's review (This content has been automatically translated from French)" Just Fine!" Keyboard 76 keys, lightweight feel. Sounds of piano, organ, piano electro are good in this price range there is no comparison. other sounds are correct. With a good amp and good speakers it sounds pretty good. 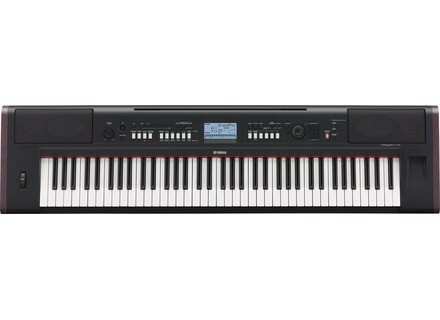 C is a good product quality / price ratio, ideal for a debutant.le keyboard has a slight touch on is far from a touch-style digital piano yamaha cp 50. The accompaniments are quite good. Sounds are good bills and at this price c is hard to beat. musicmaan's review (This content has been automatically translated from French)" Very good!" 76-key keyboard, touch not too bad, although it is far from a real piano course. Connectors suitable 5 ports: Food, Headphones, Sustain, USB to Host, USB To Device. 500 sounds, more or less good. (Sound of Strings poor, as often, if it is quite eclectic for the rest) has not editable as I know, but I could be wrong. Arranger not tried in depth, but it looks pretty good, with lots of settings. 8 / 10 for this point. If you have a problem, refer to the manual, comprehensive and intuitive. I did that for several days, and I did not even tried before, I do notice on the internet, I was gone for the NP-30 (around 300 euros) but it was not in stock, so I opted for this one, more complete. The finish is superb, and the keyboard really has the look. In addition, the pedal comes with. phil montp's review (This content has been automatically translated from French)" simple, cheap and light"
A small keyboard of 76 notes, weighted keys (weighted lightweight but still ...), amplification good enough to play alone, battery operated and industry, sustain pedal included, USB port for playing midi files. When does a good yamaha yamaha a product is consumed with eyes closed. Easy use, all styles are usable and in good order, internal sounds are not typed upscale but still nice to hear good sound rhodes, piano sounds correct as everything else. Wide range of sounds. Combinations of styles and sounds are available for replay via the keyboard of songs is very well done. One downside, the keyboard harmonious integrated amplification resents a sound amplification, the lightness of the sample on it then causes ... but it's a product is 450 €, so what more. After essyé and flunked the range casio, other income put aside the yamaha yamaha p85, a little bulky and expensive, I heard out of the range piagerro. It took me 10 minutes to test for the buy. This is a good mobile product, the sounds are correct, but the limited amplification impeccable styles very well done, the featherweight, lightweight and the keyboard is nice but little nuances play without problem.